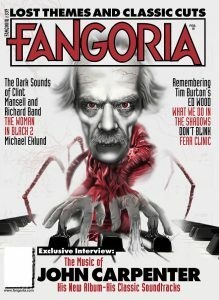 Creating the covers of industry leading magazines like FANGORIA, GOREZONE, GORE NOIR or DIABOLIQUE is a bucket list wish for horror artists. 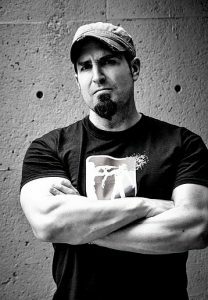 Artist Steve McGinnis has accomplished that along with impacting several different horrors based projects and products that delve into the dark corners of the genre and industry. Following a creative passion, the first book is out right now entitled RISE OF THE HARVESTER which chronicles the bloody and vengeful path of boy tormented and monster reflected on the classic horror films we grew up loving. Steve took some time out to answer questions on the first book of THE HARVESTER, influences, where evil channels through and more in PART TWO of this interview here on The Blood Shed. How long did it take you to fully plan out and develop The Harvester’s backstory? Which major horror heel did you draw most influence from? I would say Jason Voorhees or Rob Zombie’s Michael maybe even Frankenstein. It took a solid year to plan it out. His look, size, posture. I really like Rob Zombies vision of Myers. I liked the big quiet almost child like in thought. Also the questioning head tilt he did. Rob’s a creative force and definitely a influence on my work. Was the illustrating all done by hand? What was influences did you look at and experiences in creating the world around The Harvester? Yes, all done by hand. I posed or asked friends and family to pose in the way I needed and took pictures of them and sketched them from that. It gives it a more realistic feel that way. Brantwood the town in the book is actually my home town which is Brantford. I drew from everything around me. The eyes are the path to soul. Were the eyes the most crucial illustration in all different stages of “The Harvester”? Yes, they are for sure. I’m a stickler for drawing eyes. They show all the emotions. That’s why The Harvesters are just black holes. Can you talk about writing the story of the family’s struggle with “The Harvester” as a young boy and how crucial that was to the foundation of the graphic novel? I wanted to have an emotional investment in the story. Or no one would care about him. He’d just be this big killer. I wanted to show the Dad struggling emotionally with the whole awful situation. How much fun was this process for book one? What does it mean to complete a project like this after so much work with such popular and key horror publications? It was surreal to see it all come together. To see what I was imagining in print in my hands was unreal. Working with SST publications has been great. They took my first r ough self published book and made it perfect. How have the reviews been so far on the book? What has been the most challenging stage of this project? So far, the reviews have all been 5 star and people are enjoying it. I know after a while I’ll get the negative ones or people saying its crap but that happens. Everyone has their own views of it. I just wanted to put out an original horror story for slasher fans to really enjoy. What are we to expect next with “The Harvester”? Where can we find out more? Thanks for taking the time to read the RISE OF THE HARVESTER & for the support! Cheers!